Stock car racing around Ballymena United's controversial pitch is to end after the promoter stepped down from the role. Aubrey Arbuthnot has been involved with stock car racing since 1972 and he made the decision after "long and careful consideration". 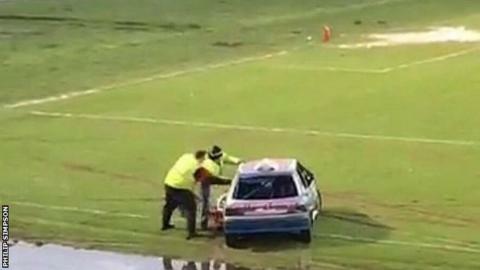 Racing competitors caused damage to the Showgrounds pitch three times last year. The venue is owned by Mid and East Antrim Borough Council. Ballymena Raceway Promotion stated on Monday that "there is not one reason in particular" for Arbuthnot's decision. The latest damage from stock car racing came last September and after a new £250,000 playing surface was laid by the Sky Blues. The new pitch has also struggled to cope with poor weather and four Ballymena games, along with the Co Antrim Shield final, have been postponed this season. An investigation was launched by the council after the Shield decider between Crusaders and Linfield was called off earlier this month. The end of stock car racing, and the poor condition of the current Showgrounds surface, opens the possibility of Ballymena considering a new artificial pitch.